For all those people who are interested in the Junior Eurovision Song Contest, here are the results and details for 2008. Well Done to Georgia in Winning the sixth Junior Eurovision Song Contest in Lemesos, Cyprus. The sixth Junior Eurovision Song Contest took place at the Spyros Kyprianou Arena, Lemesos, Cyprus, on Saturday 22 November 2008. The contest will last around 2 1/4 hours. Alex Michael & Sophia Paraskeva hosted this event. During the interval, the 2008 Eurovision Winner, Dima Bilan sang one of her songs and Believe, his winning song. Also all the contestant sang together and sang "Hand in Hand". The event was supported by Unicef where 100% profit of all phone voting goes to the Charity. Evridiki and Dimitris also perform the theme song "Fun In The Sun"
15 Countries took part. They are in performance order, Romania, Armenia, Belarus, Russia, Greece, Georgia, Belgium, Bulgaria, Serbia, Malta, Netherlands, Ukraine, Lithuania, FYR Macedonia, Cyprus. The winner was decided by televoting and for the first time in Junior Eurovision, a jury (which made up about 50% of the vote), as like the main Eurovision Song Contest. Again this year, the voting lasted through the contest and not tied into10 minutes after all the songs were heard. Georgia had sound problems and voted second last. 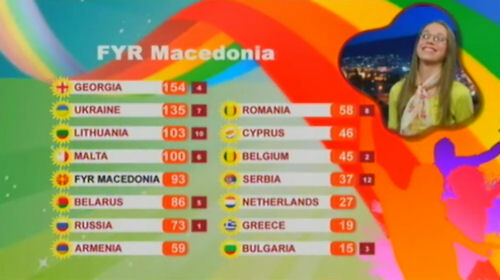 FYR Macedonia also had sound problems and voted last. Here are the songs and artist who entered the 2008 Junior Eurovision Song Contest and their final score.